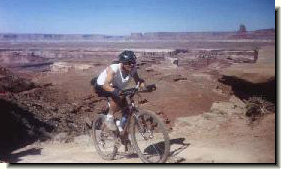 Mountain biking is my personal sport, and mountain bike touring is the best type of vacation. All of the bike ride photos featured on this site are from tours and rides we have personally done, and are mainly of the Southwest USA, but also include Illinois and Ireland. I love finding new trails to ride, and so you'll find some custom maps of our frequent biking trails in the regional cycling and touring pages. Ride as often as you can, and if you find any of these bike trails or photos helpful, or desire more mountain biking info, please leave me an e-mail. rays aaat blue-cove.com (<- anti-spam version). Want to join the Toy Camera Ring?